25 June 2018 – The Singapore Academy of Law (“SAL”) and Thread Legal are today announcing that they have become Legal Tech Partners. Thread Legal provides a practice management solution that can help SAL members to embrace technology and make their law practice more efficient. Practice management solutions, which give law firms the ability to manage their entire caseload and workflow digitally, is a critical component within any law firm’s digital journey. 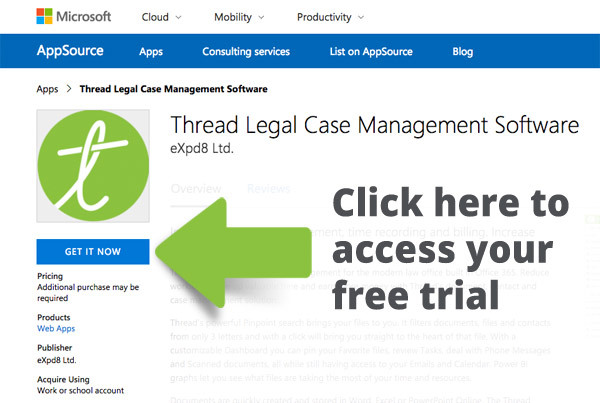 Thread Legal, built with Microsoft, offers a comprehensive set of features that help law firms to manage every aspect of their case, from time recording to workflow management. The Singapore Academy of Law is a promotion and development agency for Singapore’s legal industry. Our vision is to make Singapore the legal hub of Asia. SAL is led by a Senate headed by Chief Justice Sundaresh Menon, and comprising the AttorneyGeneral, the Supreme Court Bench and key leaders of the various branches of the legal profession. It has more than 12,000 members, including the Bench, all persons who are called as advocates and solicitors of the Supreme Court (i.e. the Bar) or appointed as Legal Service Officers, corporate counsel, faculty members of the three local law schools (i.e. National University of Singapore, Singapore Management University and Singapore University of Social Sciences) and foreign lawyers in Singapore. The comprehensive solution provides features such as legal case management, time recording, expenses and billing, workflow management, document management and integrations with accounting software such as Xero. Thread Legal was founded by Executive Chairman Declan Branagan, who has been working with the legal industry for over thirty years. Declan is an entrepreneur, who started his first business in 1984 and has since grown eXpd8 Ltd. into a successful business with customers worldwide. He launched Thread Legal after realising that future-focussed lawyers needed a new solution that combined the latest technologies with a deep understanding of lawyers’ working practices, and provided genuine ways to increase productivity. Thread Legal is a product of eXpd8 Ltd., an Irish company that has been supplying software to the legal marketing since 2001.